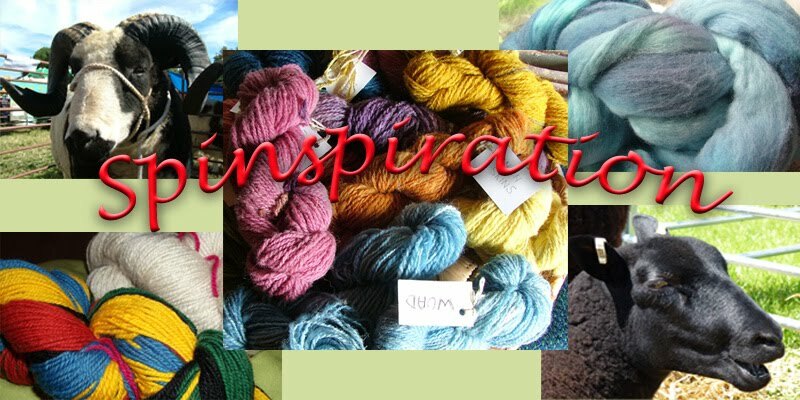 Spinspiration: Dawns adventures for Woolly Wednesday October! 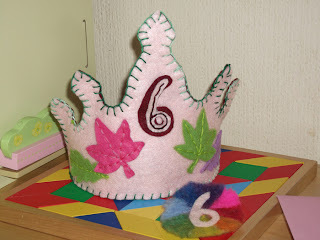 Another month already, how did that happen? 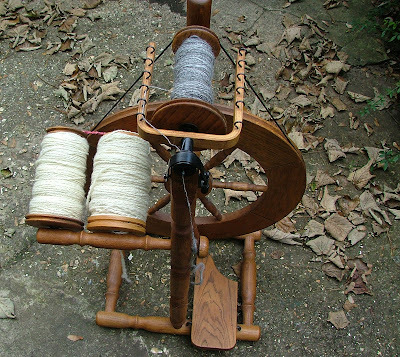 I wan to do some serious spinning next month, or at least over the Autumn and Winter months as I'm feeling it is getting neglected at the moment. September was a busy month for me with my daughter Imogen returning to school and it being her 6th birthday later in the month so my hands were busy on other projects, at least some of them were woolly so I will share those those month. I love bunting and have various bits of bunting to hang for celebrations. These include knitted bunting for Imogen for her birthday so I recently knitted a new bunting triangle for her age. 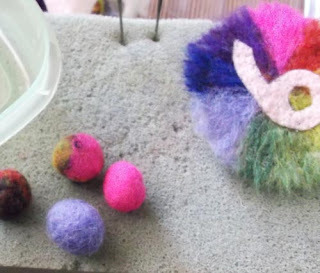 I also have a tradition of making her a felt crown and badge so have used some bought wool felt mix, and used a combination of wet felting and needle felting and sewing to create these for her this year which she loved and showed them to her teachers and friends at school. I've also started doing some other felting and planning some gifts for Christmas, but maybe I'll share those next month. 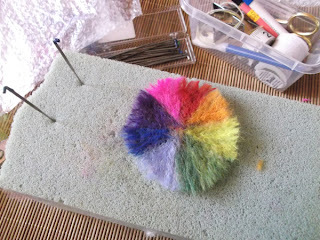 Imogen is also desperate to do some felting so we are hoping to do that soon too - she's had her eye on the fibre I was spinning in this post - the bright rainbow mix. So watch this space. 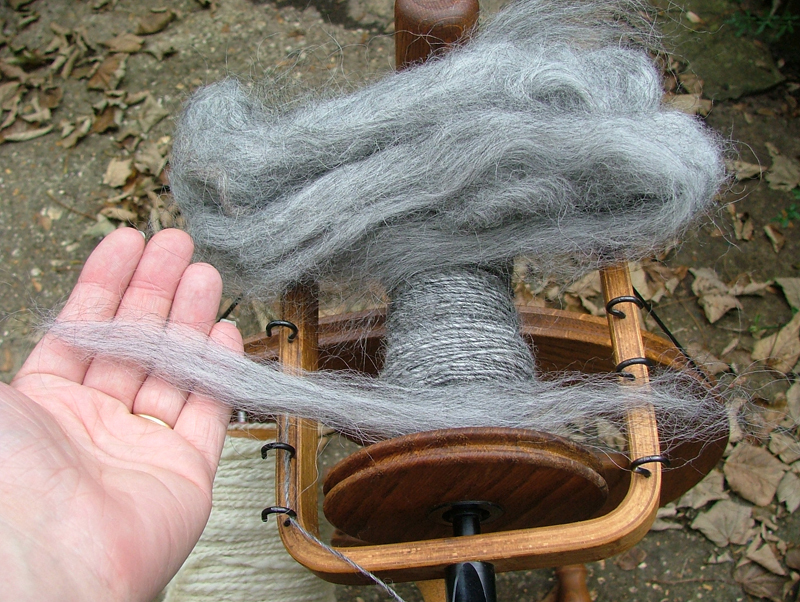 So onto spinning. 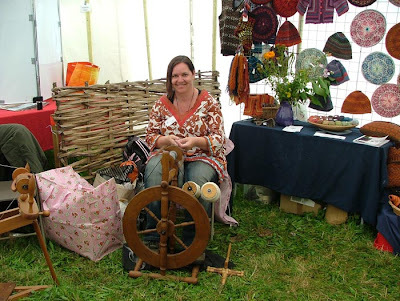 I have done a little spinning when I attended the Romsey Show - an agricultural show locally which the Guild has had a presence at for some time. That's me above in the photo, struggling at that time as we had just been for a walk and I still had my walking shoes on and I cannot treadle well with them! I was soon barefoot again, my preferred footwear when spinning. 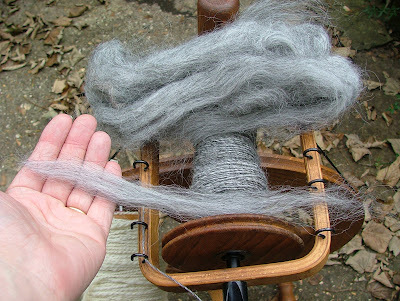 I took the Louet wheel and some Icelandic grey roving so I didn't need to do too much preparation before spinning. It's a lovely long staple fibre and a lovely colour. 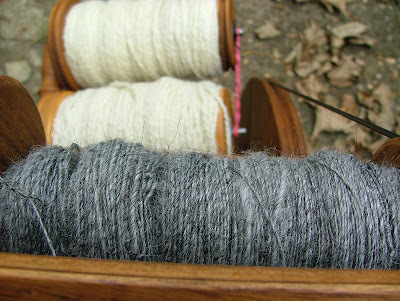 I have some other colours of Icelandic too as they range from white to brown to greys. No idea what I shall be doing with this wool although it's not next to skin softness so maybe something like a bag which I may felt too. Other projects still on the go are the socks and the weaving squares that I blogged about last month, the weaving squares cushion should be finished by next month so I can share more pictures of that then. 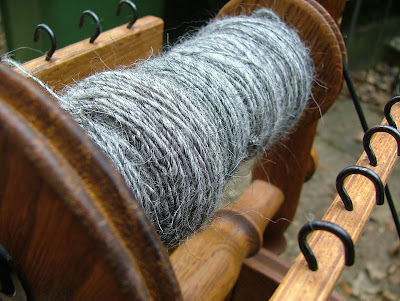 Actually maybe that's what I can use the Icelandic wool for - using it in weaving as a single. So what has everyone else been up to with their wool and fibres this month?